How do I read my auto insurance policy? What If I"m Hurt in a Crash? Think about the unthinkable...then you will be better prepared to financially survive it. Wildfire is a growing threat in the Rocky Mountain Region, where the population is booming in the mountains and foothills. People often don't realize the dangers of living in the Red Zone (dangerous wildfire area). They're drawn here by the breathtaking views, but they don't always see the potential for losing their homes to wildfire. To help protect themselves and their property, homeowners need to be aware of the importance of mitigating wildfire hazards AND be aware of the insurance impact of living in high-risk areas. The Rocky Mountain Insurance Information Association has partnered with government agencies to provide homeowners information on protecting their properties against wildfires and making them more insurable. Partners include the Front Range Fuels Treatment Partnership, the U.S. Forest Service, Colorado State Forest Service, Colorado Division of Emergency Management, the Front Range Fuels Treatment Partnership Roundtable, the New Mexico Insurance Division, and New Mexico State Forestry. 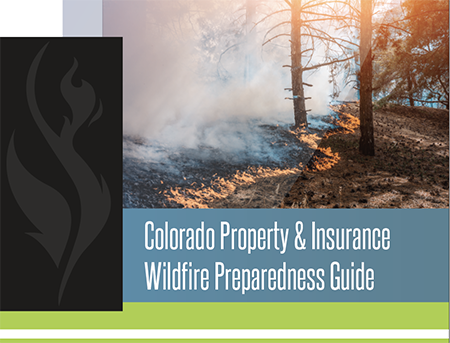 In September 2016, Carole Walker, Executive Director of the Rocky Mountain Insurance Information Association presented through a Virtual Workshop Series for Firewise. In this presentation, she answered many Frequently Asked Questions about Wildfire and Insurance for homes in the Wildfire Urban Interface (WUI). Ask An Expert Firewise Virtual Workshop Series is presented by the National Fire Protection Agency and consists of hour-long workshops designed to connect wildland fire stakeholders with subject matter experts. The Firewise virtual workshop series provides conference quality, free learning opportunities for wildfire stakeholders, by connecting them with leading researchers and practitioners in a live interactive format. Each session is an hour-long and features a wildfire related topic that closes with questions received directly from participants. Contact RMIIA to have a copy mailed to you. What is an insured catastrophe? What Should I Do After a Disaster? How can I slow down a wildfire headed toward my house? How can I help firefighters save my home? What should I do after a wildfire? © 2015 Rocky Mountain Insurance Information Association. All rights reserved.